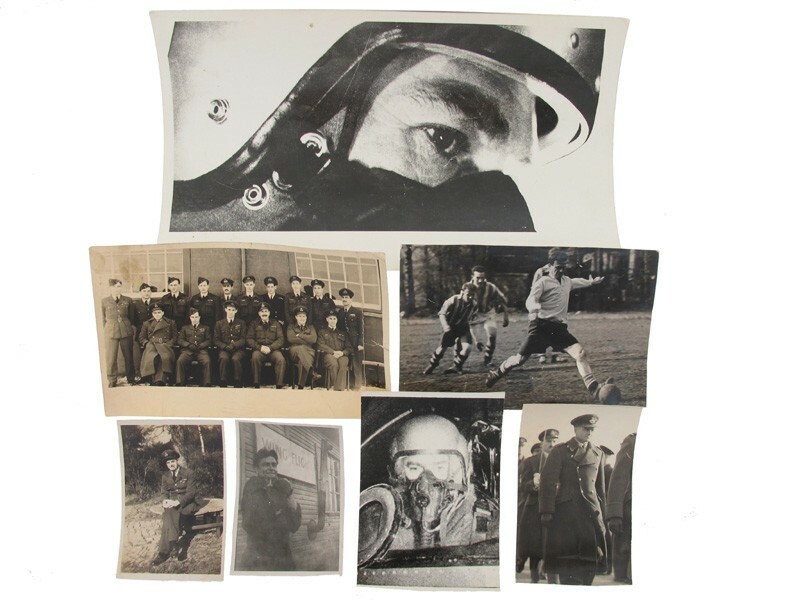 A rare Second World War D.F.C., post-war A.F.C. 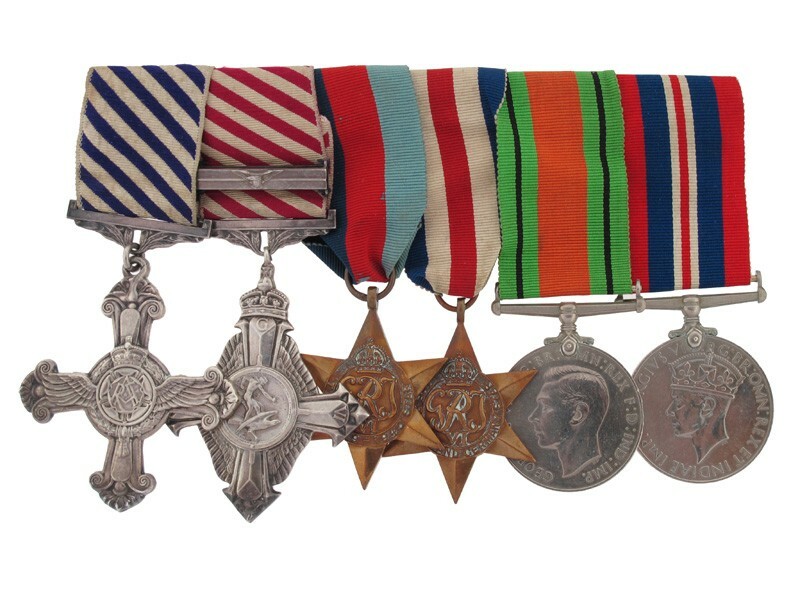 and Bar group of six awarded to Squadron Leader C. Watkinson, Royal Air ForceDistinguished Flying Cross, G.VI.R., the reverse officially dated ?1945? ; Air Force Cross, G.VI.R., with Second Award Bar, the reverse of the Cross officially dated ?1951? 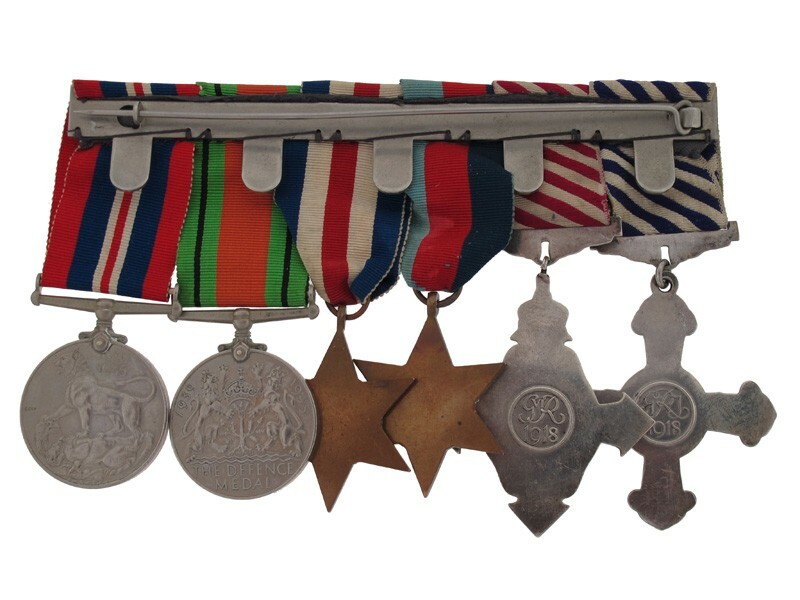 and the reverse of the Bar ?1959?, with its Royal Mint case of issue; 1939-45 Star; France and Germany Star; Defence and War Medals 1939-45, mounted as worn, together with his R.A.F. 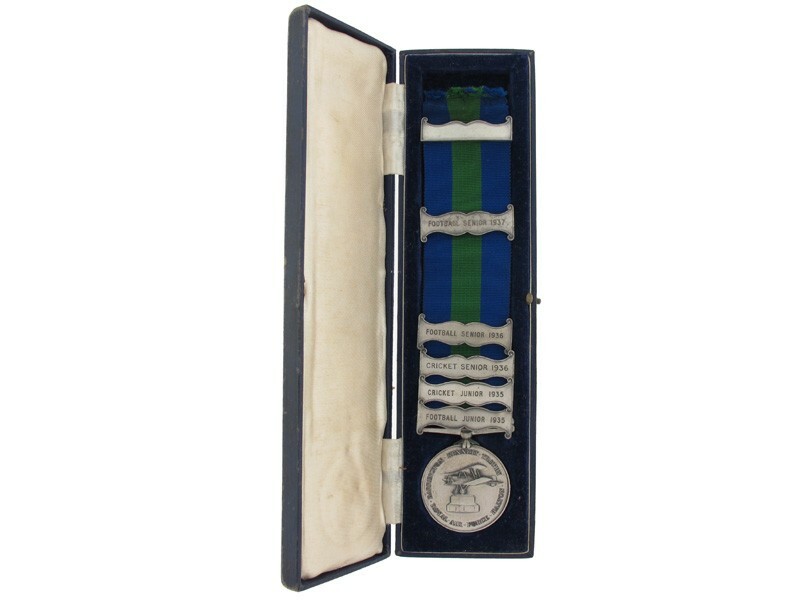 Halton Barrington-Kennett Trophy Medal, silver, with 5 clasps for Football and Cricketing events 1935-37, the reverse named to ?A./A. 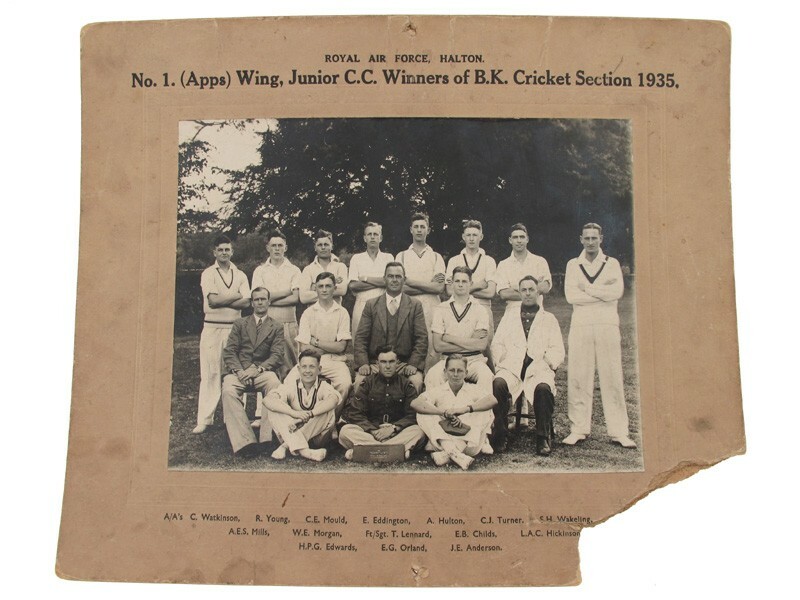 Watkinson, C.?, in its fitted case of issue, his embroidered R.A.F. 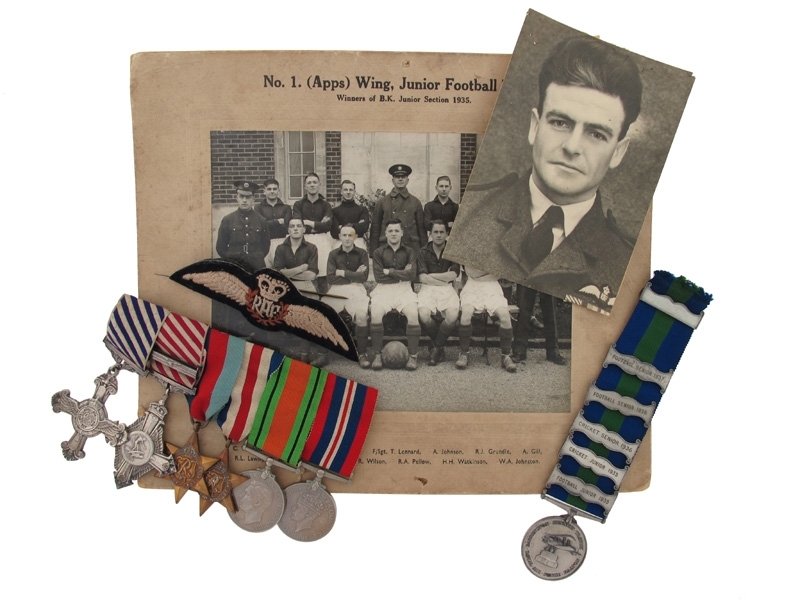 Wings, a set of uniform tunic ribands, a pair of cufflinks and one or two badges, contact marks, generally very fine or better. Footnote: D.F.C. London Gazette 16 February 1945. The original recommendation states:?This officer has proved himself to be a highly efficient and determined captain of aircraft.On his first operation, a night attack against Russelheim, his Flight Engineer became seriously ill on the final stages of the route to the target, and remained completely incapable of performing his duties for the remainder of the trip. In spite of this handicap to an inexperienced crew the attack was successfully pressed home and a safe return achieved.On the following sortie, to Kiel, Watkinson?s aircraft was repeatedly attacked by night fighters for a considerable period before and after bombing the target. Again, however, the attack was pressed home in a determined fashion and two enemy aircraft were probably accounted for by his gunners.Since these early incidents, this pilot has continued to carry out in a courageous and unassuming manner missions of a varied nature, allowing nothing to deter him from the important task of bombing the target. His reports have, in every instance, been accurate, sincere and absolutely reliable, and in carrying out, so far, a total of 27 sorties, his contribution to the war effort has been magnificent.In recognition of this fine devotion to duty at all times, and his unswerving loyalty and sincerity as a captain of aircraft, I strongly recommend the award of the Distinguished Flying Cross.?A.F.C. London Gazette 1 January 1951. 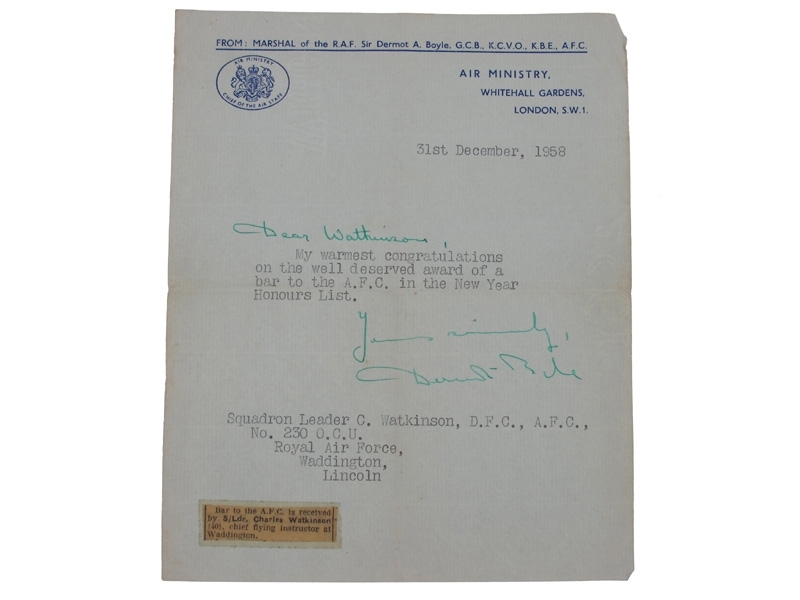 The original recommendation states:?Flight Lieutenant Watkinson is a qualified Flying Instructor and had been employed in this capacity in No. 204 Advanced Flying School since July 1948. Since joining the unit this officer?s forceful personality has shown itself in every sphere of the unit?s activity. As Senior Flight Commander of the unit he has cheerfully accepted a big burden of responsibility and has worked untiringly for long hours in improving the organisation of thus unit. No situation, however unpleasant or desperate, perturbs him and his cheerful infectious spirit has assisted greatly in carrying both instructors and pupils through the many difficult times the unit has encountered as a result of frequent moves.At all times he sets a most inspiring example of efficiency and devotion to duty. He is also a very capable ground engineer and had given much thought and assistance in the improvement of Mosquito servicing to the technical staff during the past year. Instructing pupils ex Flying Training School on Mosquitos so that they are complete masters of this aircraft under all conditions by day and night is a task which calls for very high qualities in the instructor. Flight Lieutenant Watkinson has carried out these duties with outstanding success. As a qualified Flying Instructor at No. 204 Advanced Flying School, Flight Lieutenant Watkinson has rendered outstanding service. By his enthusiasm and efficiency as a Flying Instructor on Mosquitos he has set an excellent example to instructors and pupils alike. ?Bar to A.F.C. London Gazette 1 January 1959.Charles Watkinson, who was born in June 1918 and enlisted in the Royal Air Force in January 1935, was commissioned as a Pilot Officer in April 1943 after qualifying as a pilot out in Canada. Posted to No. 90 Squadron, a Stirling unit operating out of West Wickham in Cambridgeshire, in the Summer of 1943, he completed his first sortie, as outlined above, against Russelheim on the night of 25-26 August. At least a dozen daylight sorties followed over the coming weeks, and in addition to four strikes against Calais, his targets including Bonn, Dortmund, Duisberg, Essen, Frankfurt, Stettin, Stuttgart. He was recommended for the D.F.C. in November 1944.Post-war, he remained a regular and was onetime Chief Flying Instructor at Waddington, gaining the the A.F.C. 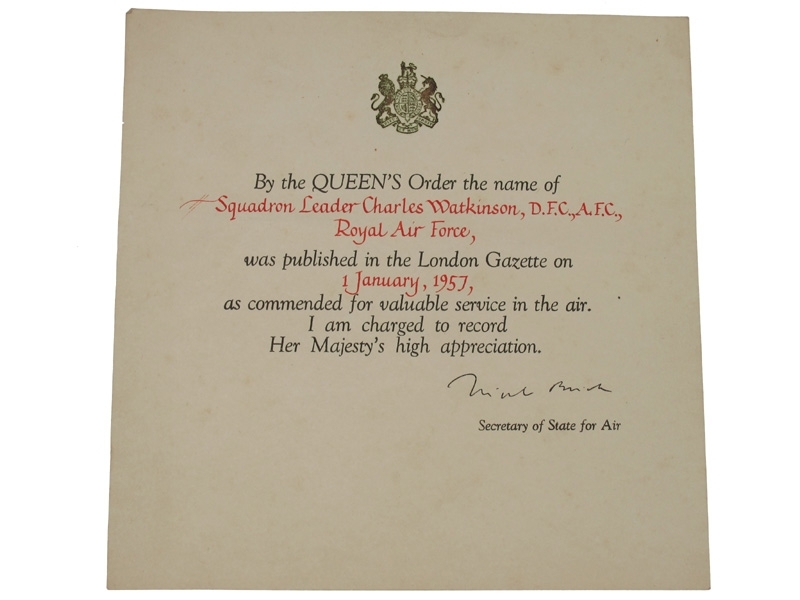 and Bar in addition to the Queen?s Commendation for Valuable Service in the Air (London Gazette 1 January 1957 refers). 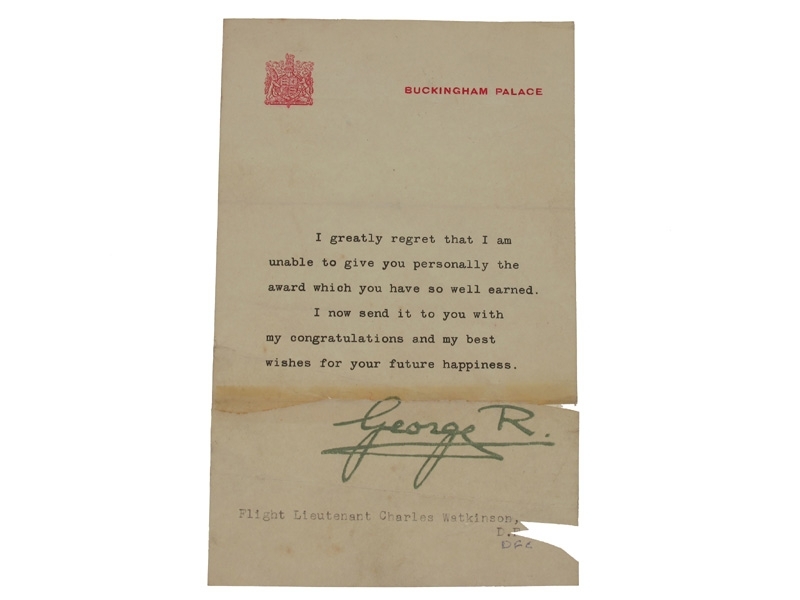 Advanced to Squadron Leader in January 1953, he was placed on the Retired List in March 1959.Sold with a quantity of original documentation, including his Queen?s Commendation certificate, dated 1 January 1957; Buckingham investiture letter, dated 11 February 1959; congratulatory letters regarding the award of the Bar to his A.F.C. 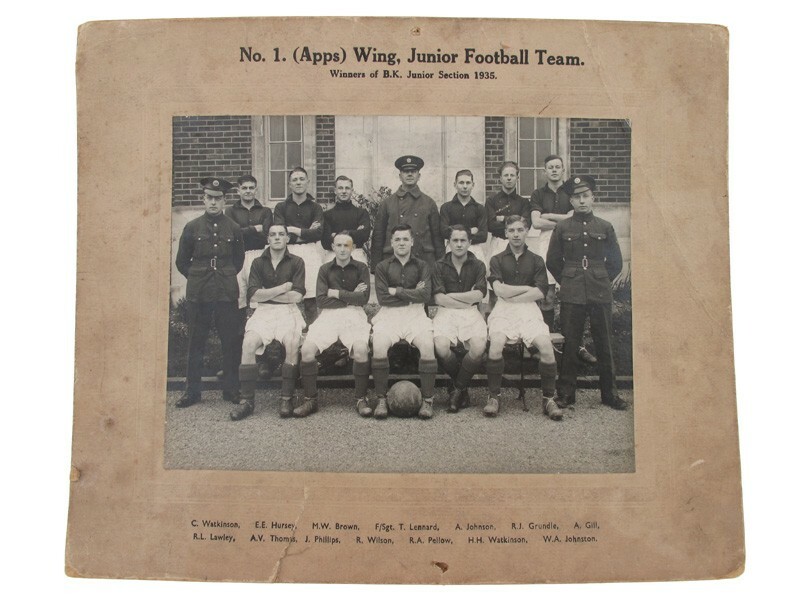 (2), including one from Marshal of the R.A.F. Sir Dermot Boyle, dated 31 December 1958; R.C.A.F. 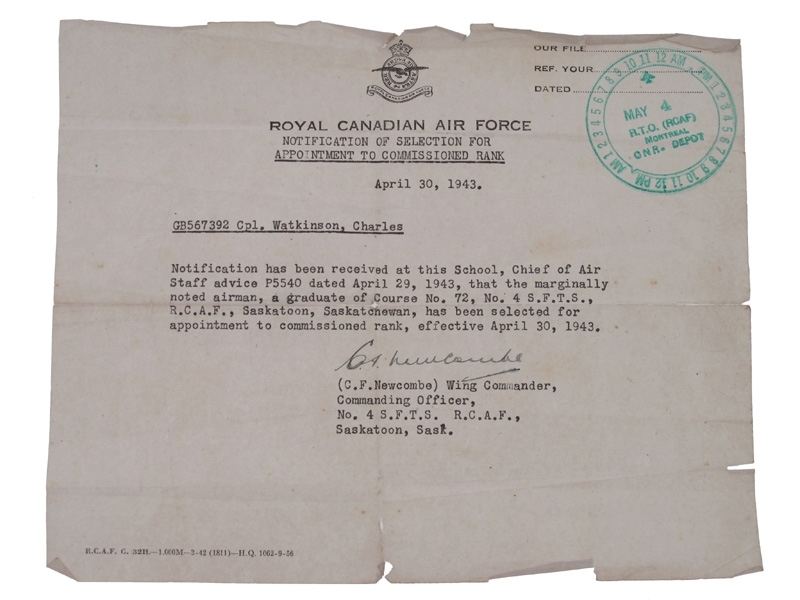 letter of notification regarding his appointment to a commission, dated 30 April 1943; Air Ministry retirement letter, dated 20 February 1959; and a selection of career photographs (approximately 15 images), including two card-mounted and titled Halton team shots. N.B.The recipient?s Flying Log Books, covering the period 1942-58, are known to be extant.